The Fellowship was fortunate enough to obtain a copy of REAL HEROES #1 from Image Comics. 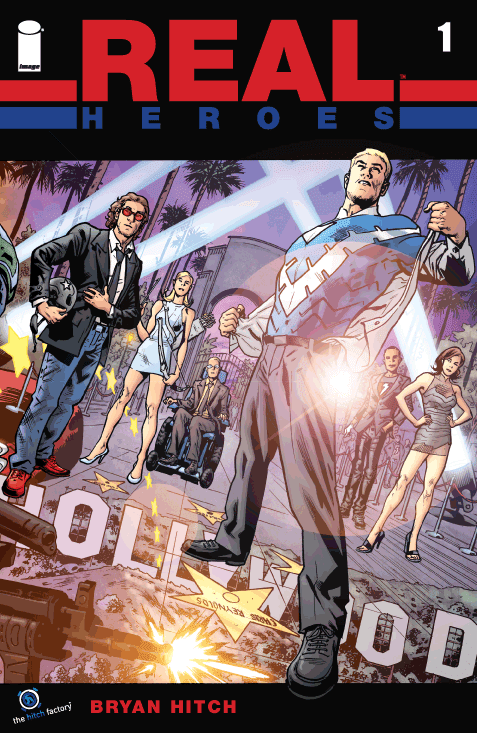 Bryan Hitch writes and draws, Paul Neary inks and Laura Martin colors. The biggest movie in the world is about a team of supers saving the world. Cue the biggest premiere in history, with all six actors present and accounted for, egos and all. But when a prop starts actually blowing things up, the cast starts running away, escaping through some kind of portal into a destroyed New York. And now they’re being asked to save the world for real. The end of this issue is the mother of all awkward moments, and I say that as a huge compliment. These people don’t belong here, and they don’t have any skills at all to handle the problem facing them. The issue does a nice job of setting up the six “heroes” as a wide variety of individuals with diverse backgrounds and coping skills. It’s an interesting team, enough so that it makes me curious to see if they can pull this off, whatever it is. Though it may look like this title is trying to ride certain coattails, there are some serious story ideas packed inside. “Appearances can be deceiving” may turn out to be a running theme in this book, in a good way. REAL HEROES #1 is available now at your FLCS or at imagecomics.com.